Nickelodeon Australia is turning up the slime-o-meter and bringing new adventure series SLIME CUP to Aussie kids. The six-episode series promises more slime, teams and challenges than ever before in the history of Nickelodeon Australia. SLIME CUP combines all the elements which Australian kid audiences have loved in long-standing properties such as Camp Orange and SLIMEFEST. The new series invites kids from across Australia and New Zealand to team up with their best friend and vie for a place in the uniquely slimy competition. SLIME CUP is open to all kids aged 9 – 13 in Australia and New Zealand. To enter, kids can submit their audition videos online or for the first time ever, pre-register to complete a series of challenges at on-ground events in Melbourne (Sunday, 10 April from 10am – 4pm at Westfield, Fountain Gate) and Sydney (Sunday, 17 April from 10am – 4pm at Westfield, Mt Druitt). 16 teams will then be selected to compete in the Semi-Finals – a series of larger-than-life challenges that will test their stamina, strength and stomachs to determine the final four teams. 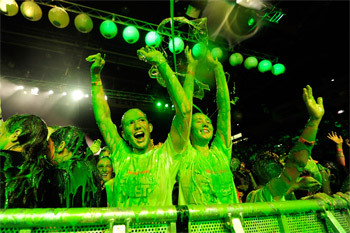 The Finale episode will see the four teams compete to win the ultimate prize of being the 'Guardians of Slime" at Nickelodeon's flagship event SLIMEFEST in September. But it's not just kids who will face the mess and mayhem of SLIME CUP. Parents will also be randomly included in the Semi-Finals of the series, upping the ante on the stakes of each challenge. This year, SLIME CUP will be hosted by budding Australian actress, Kristy Best and a U.S. based Nickelodeon star yet to be announced. Sydney based Kristy will be front and centre on the sidelines reporting on the bugs, the slime and the wacky challenges kids will face throughout the series. Kids who think they have the speed, the smarts and a stomach of steel can go to nick.com.au to register for the Sydney and Melbourne audition days or submit their best audition video up until Sunday, 24th April 2016. SLIME CUP will premiere on Nickelodeon at 5.30pm on Friday, 1st July 2016. Kids can check out www.nick.com.au to vote for their favourites, watch short-form clips, play games and see all the behind-the-scenes action.